1Department of Biology, Faculty of sciences, Mashhad Branch, Islamic Azad University, Mashhad, Iran; 2Department of Biology, Faculty of Sciences, University of Zabol, Zabol, Iran. Copyright © 2013 Seyed Mohammad Mousavi et al. This is an open access article distributed under the Creative Commons Attribution License, which permits unrestricted use, distribution, and reproduction in any medium, provided the original work is properly cited. In the present research, micromorphological features of 10 Salvia L. nutlets (mericarp) growing in NE Iran were studied by SEM. These species were divided into three and four groups based on the shape and ornamentation of nutlets respectively. The variation in color, size and ornamentation of mericarp helped to identify species. Salvia L. belongs to the family Lamiaceae, comprises about 1000 species distributed in temperate and subtropical regions . This genus has 58 species in Iran in which 17 species are endemic [2-4]. Based on Flora Iranica report, 17 Salvia species were distributed in NE Iran . In the present research, micromorphological features of mericarps were assessed for first time in Iran due to high hybridation rate between Salvia species  and commercial importance of their nutlets. Although Salvia is the largest genus of Lamiaceae, its mericarp morphology has been poorly reported. There have been a few reports of external micromorphological study on the mericarp of Salvia such as, Nutlet morphology and its taxonomic utility in Salvia from Turkey , Morphology, anatomy, palynology and nutlets micromorphology of the rediscovered Turkish endemic Salvia ballsiana and their taxonomic implications , Morphology, anatomy, palynology and nutlets micromorphology of Salvia macrochlamys in Turkey . This research tries to present identification key of species based on micromorphology of mericarp. Mericarp features of 10 Salvia species from NE Iran kept in FUMH including: S. ceratophylla L., S. chorassanica Bunge, S. aethiopis L. S. atropatana Bunge, S. leriifolia Bent, S. sclarea L., S. macrosiphon Boiss, S. chloroleuca Rech. f. & Aellen, S. virgata Jacq., S. nemorosa L. were examined. 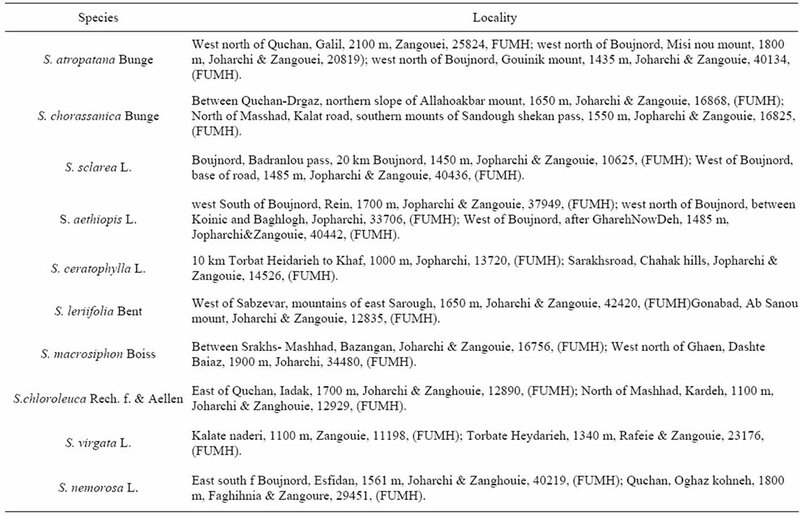 The localities of studied Salvia species were presented in Table 1. 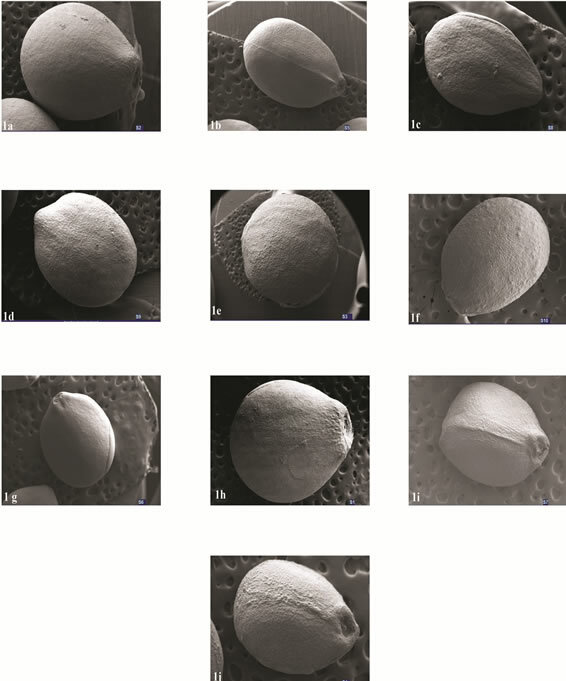 The nutlets were coated with sputter and studied by SEM XL 30. The features such as the size, color, shape, polar axis length/equatorial axis length and ornamentation were evaluated in magnification 25 and 500. Table 1. The localities of studied Salvia species. Spherical mericarp, P/E 1.26, dark brown, reticulate with square and irregular reticulations or nets, hairy, the length of reticulations were 25 - 50 µ (Figures 1(a) and 2(a)). Trigonous and prolate spheroidal mericarp, P/E 1.63, light brown, with distant irregular circular prominence, the distance between prominences were 50 - 70 µ (Figures 1(b) and 2(b)). Trigonous and prolate spheroidal mericarp, P/E 1.57, pale brown with regular hexagonal prominence, the distance between prominences were 20 µ (Figures 1(c) and 2(c)). Spherical mericarp, P/E 1.39, black, with close, irregular circular prominences, the distance between prominences were 30 µ (Figures 1(d) and 2(d)). Spherical mericarp, P/E 1, black, with irregular hexagonal prominences, the distance between prominences were 20 µ (Figures 1(e) and 2(e)). Ovoid mericarp, P/E 1.37, pale brown, stripped with regular, deep and coarse grooves, the distance between grooves were 2 - 3 µ (Figures 1(f) and 2(f)). Spherical mericarp, P/E 1.15, dark green stripped with minute and irregular grooves, the distance between grooves were 0.5 - 1 µ (Figures 1(g) and 2(g)). Spherical mericarp, P/E 1.36, light brown, yellow, stripped with minute, irregular and shallow grooves, the distance between grooves were 1 - 2 µ (Figures 1(h) and 2(h)). Figure 1. 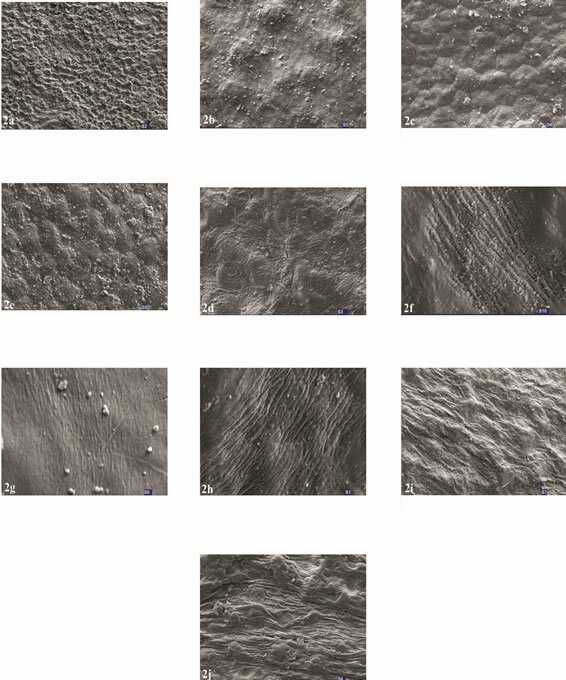 Electromicrographs of mericarps: (a) S. ceratophylla, (b) S. chorassanica, (c) S. aethiopis, (d) S. atropatana, (e) S. lerrifolia, f) S. sclarea, (g) S. macrosiphon, (h) S. chloroleuca, (I) S. virgata, (J) S. nemorosa. Figure 2. Electromicrographs of mericap: (a) S. ceratophylla, (b) S. chorassanica, (c) S. aethiopis, (d) S. atropatana, (e) S. leriifolia, f) S. sclarea, (g) S. macrosiphon, (h) S. chloroleuca, (i) S. virgata, (j) S. nemorosa. stripped, with coarse-fine grooves and close prominences, the distance between prominences were 15 - 20 µ (Figures 1(i) and 2(i)). Ovoid mericarp, P/E 1.38, black, undulated-stripped, with distant coarse-fine grooves and distant circular prominences, the distance between prominences were 40 - 50 µ (Figures 1(f) and 2(f)). d) Prominent stripped in S. virgata and S. nemorosa. Ozkan et al., reported the nulets are placed in three groups based on the shape and ornamentation (spherical, trigonous and prolate spheroidal) and (foveate, reticulate and verrucate) respectively . Between 12 studied Salvia nutlets in their study, S. ceratophylla, S. aethiopis and S. virgata were common with the present research. Ozkan explained S. aethiopis and S. virgata nutlets ornamentation are foveate and reticulate while in present research, it was preferred to name, surface with hexagonal prominences and undulated stripped respectively. Also, Kahraman et al. pointed the size, shape and ornamentation of S. ballsiana, S. macrochlamys and S. hedgeana are diagnostic [7,8]. In conclusion, the shape, color and ornamentation of Salvia mericarps varied among the species and those are taxonomical characters help to identify species. C. Ozdemir and G. Senel, “The Morphological, Anatomical and Karyological Properties of Salvia sclarea L.,” Turkish Journal of Botany, Vol. 23, No. 1, 1999, pp. 7-18. I. C. Hedge, “Labiatae,” In: K. H. Rechinger, Ed., Flora Iranica, Academische Druck-U. Verlagsantalt, Graze, Vol. 150, 1982, pp. 403-476. I. C. Hedge, “Salvia L. ,” In: P. H. Davis, Ed., Flora of Turkey and the East Aegean Islands, Vol. 10, Edinburgh University Press, Edinburgh, 1982, pp. 400-402. I. C. Hedge, “Labiatae,” In: S. I. Ali, Ed., Flora of Pakistan, Royal Botanic Garden, Edinburgh, 1990, pp. 193- 217. S. Haqe‚ “Chromosome Numbers in the Genus Salvia L.,” Proceedings of the Indian Academy of Science, Vol. 47, 1981, pp. 419-426. M. Özkan, K. Aktab, C. Özdemir and G. Gurin, “Nutlet Morphology and Its Taxonomic Utility in Salvia (Lamiaceae: Mentheae) from Turkey,” Acta Botanica Croatica, Vol. 68, No. 1, 2009, pp. 105-115.